The present site of Cleveland's Agora Theater has quite the rich history in entertainment! Construction began in 1910 under Max Faetkenheuer, an opera promoter. Known as the Metropolitan Theater, it officially opened on March 31, 1913 with a performance of Aida. 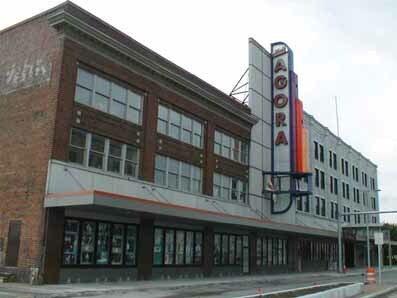 Over the years, the venue would serve a number of purposes under a slew of different names before finally becoming the third and final home of the Agora Theater, a live music venue, in 1985. Elvis Presley, The Beatles, Meatloaf and Marilyn Manson are just some of the big names who have shared this space while it was a local radio station's concert hall, a vaudeville/burlesque show, a movie house, and now the premier live venue it is today. And while that's quite an impressive celebrity guest list, probably the most famous 'performer' associated with the Agora is an unknown man seen in a yellow raincoat. This man, who local psychic Sonya, calls 'John,' has been seen all around the theater. He has been witnessed by stagehands on the stage itself and even on the stairs to the balcony. One club kid even saw the man in the yellow raincoat during a rave. A bottle of Ecstasy had apparently fallen to the floor and as others around him scrambled to scoop up the pills, the look the man in yellow gave this guy was enough to cause him to refrain from joining them! His favorite 'haunt,' however, seems to be on the catwalk. John is also believed to be the cause of strange feelings of a presence in the basement lounge and for driving the cleaning crew crazy by locking and unlocking doors. John may have some friends, though. A photographer taking some shots of the old theater noticed a group of people sitting out in the audience, whom he thought were workers. He approached them in order to thank them for allowing him to photograph the location, but they had disappeared without a trace. No one is really sure who John is or why he is there and he might not even still be there at all! Not long ago, Psychic Sonya allegedly conducted an exorcism of sorts in an effort to bring peace to John and the Agora. Afterwards, staff report that things did calm down, but still believe the theater to be haunted. Although it probably doesn't account for John's identity, one interesting story I found about the theater was that it was the home base for a Yiddish theater troupe in 1927. In 1928, the crew was on its way to Youngstown when their bus crashed. Too injured to perform, their company went bankrupt a short time later.